On January 8th, Venezuelan President Hugo Rafael Chávez Frías announced the devaluation of the Bolivarian Republic’s currency, the bolivar. In his address, Chávez distinguished between two classes of products, establishing separate exchange rates for “essential” and “non-essential” goods. This news prompted concern for inflation among Venezuelan citizens and followed other signs of trouble that have been afflicting the country, such as severe drought, rolling blackouts in order to ration electricity, and aggressive rhetoric accusing the United States of violating Venezuelan airspace. Although the currency devaluation could yield positive results for the long-term development of the Venezuelan economy, immediate political factors seem to have provided the primary motivation for the government’s decision-making at this time. The dual exchange rates expose the interrelated economic and political motives that led to the currency’s devaluation. As one exchange rate will shield the poorest sections of Venezuelan society from the worst effects of the devaluation, the exchange rate is designed to adjust the economy to allow for long-term growth. While inflation has grabbed the recent news headlines, corruption in the political sphere is a side effect of the economic crisis that no longer can be ignored. Chávez announced a weak devaluation of the bolivar from 2.15 per dollar to 2.6, when allocated to purchase “essential” items, such as food, health and education-related supplies, as well as remittances. “Non-essential” goods, including everything from oil to manufactured goods, however, will qualify for second tier treatment, where goods will be valued at 4.3 bolivars per dollar, double the previous rate. In a strategically timed national address (it took place during a popular baseball game), the Venezuelan president explained that the goal of this adjustment was to provide diversification in the economy and allow for long-term growth—both being reasonable goals that coincide with the new policy, but are perhaps too optimistic, when one considers who will have to bear the brunt of the policy. Early last year, Mark Weisbrot, Rebecca Ray, and Luis Sandoval of the Center for Economic Policy and Research (CEPR) reported that Venezuela’s “currency is still very overvalued. This is something that will have to be remedied if Venezuela is going to pursue a long-term development strategy that diversifies the economy away from oil.” In the article, the authors examine the country’s performance, looking at both economic and social changes, and come to the conclusion that Venezuela experienced a healthy expansion between 2003 and mid-2008, nearly doubling its real gross domestic product. Much like the U.S. and the rest of the world, Venezuela fell into a recession in 2009, and the new monetary policy denotes an attempt to restore economic vitality. The CEPR economists assert that the devaluation of the bolivar is necessary to permit continued growth. They argue that an exchange rate that is too high discriminates against domestic producers, particularly those manufacturers making complex final products. Further, they explain, “[an overvalued currency] makes imports artificially cheap and the country’s exports more expensive on world markets, thus putting the country’s tradable goods at a serious disadvantage in both international and domestic markets.” The devaluation, then, should discourage imports, which will be more expensive, and allow domestic industries to compete in their native markets. The development of domestic industries will, most likely, diversify the economy and reduce its dependence on oil. In this respect, the Chávez administration is pursuing its stated goal of increased, sustained development. The intended benefactors of this policy are clear. The government will receive increased revenue from the export of oil, while the more valuable rate for essential goods will protect the interests of the nation’s poor. In an interview with COHA, Douglas Walker, Professor of Economics at Regent University’s Robertson School of Government and a former United Nations Senior Economics Affairs Officer, readily identified the Venezuelan government as the chief benefactor from this policy, noting that the policy was also designed to “shelter” the poor. He expressed doubt, however, that the policy is likely to achieve its stated goals. The brunt of the policy, he asserted, will fall on domestic producers. Walker explained that Venezuelan manufacturing industries will have to confront inflation as they attempt to import the goods necessary to continue production. Therefore, as prices for these imported goods rise, producers will have trouble keeping their own prices down. Even with their competitors’ prices forced upward, though, domestic producers can anticipate having trouble competing as the domestic industries are simply not sufficiently developed to compete. This can be seen in a recent New York Times article, which reported that Venezuela imports 90 percent of the manufactured goods that the nation consumes. From the Venezuelan people’s perspective, the prices for all these goods will soon double. When asked what effects this policy can be expected to have on the Venezuelan economy, Dr. Walker assured COHA that inflation is imminent, stating, “This will expand the domestic money supply. This will increase the amount of domestic currency in government’s hands.” With parliamentary elections approaching in September, Walker joins many other economists in believing that the current Venezuelan administration, knowing that devaluation would be inevitable, made the move earlier, rather than allowing it to bring on its adverse repercussions if it occurred closer to the election. An alternative goal from the Chávez administration’s perspective emerges when one considers what effects this policy will create for government revenues. Right now, Caracas relies heavily on public expenditures to facilitate its social initiatives. Thus, Venezuela’s designation of oil—its primary export—in the “non-essential” goods category reveals its clear intention to increase the amount of domestic currency that it has available as the elections approach. We have seen that oil constitutes an overwhelming 90% of Venezuela’s exports and nearly 50% of its government revenues, according to CIA statistics. Thus, doubling the number of bolivars that the government will receive for each barrel of oil the country exports has to make a significant impact. With increased bolivars from oil sales in its pockets, the Chávez administration will be able to continue to bankroll its social initiatives. The exchange rate for essential imports will remain high because this strategy will maintain lower prices for goods, which the Venezuelan poor are known to be sensitive to any price fluctuations, such as for food or medical supplies. For the government, this represents a political motivation as much as an economic one. Increasing the price of food would hurt the people and certainly would not attract much good will in the government’s favor in the public’s eyes. The exchange rate will protect the prices of these essential goods, as well as the ongoing political backing of the popular classes. As a commodity, crude oil does not respond to the actions of a single supplier in the market. Even as a member of OPEC, Venezuela has little control over the revenue that it can generate through selling its own oil production. Setting the exchange rate for oil at 4.3 bolivars per dollar, however, effectively doubles the inflow of revenue that the Chávez administration will receive for each barrel of oil that it sells. Nevertheless, the devaluation is sure to create inflationary pressures as the price of “non-essential” goods increases. Eventually, prices will inflate to reach a new equilibrium, undermining the increased buying power that the Venezuelan government has gained from this maneuver, as part of the benefits brought on by this short-term strategy. As elections approach in September, this increased income will provide a welcome source of revenue as the government campaigns to boost its popularity. The devaluation of the currency also can be expected to create negative consequences for entities outside of Venezuela. Trading partners that export “non-essential” goods to Venezuela will experience a fall in demand for their goods, as their prices rise significantly on the Venezuelan market. Foreign investors caught holding Venezuelan currency likewise will fear the pain of the adjustment. Companies like Goodyear Tire that maintain large operations in Venezuela, and possess large amounts of Venezuelan bonds, stand to suffer debilitating losses as the value of bonds denominated in bolivars fall by 50 percent due to the devaluation. In a telephone conversation with COHA, Goodyear spokesman Keith Price failed to confirm a 350 million dollar loss reported by Businessweek and would not anticipate how the devaluation would affect Goodyear’s continued operations in the country. These negative side effects, however, come as little surprise, as Chávez has displayed a history of showing little concern for the interests of stakeholders residing outside the country’s borders. Venezuela’s recent devaluation demonstrates an effort on the government’s part to spur economic growth. There is no reason to doubt that these long-term goals are being firmly sought after. Devaluing the currency will allow domestic industries to compete with foreign producers within the country because the price of domestic goods will decline relative to the price of foreign products. Likewise, the price of imported goods will rise relative to the price of domestic goods. The change in prices will stimulate an increased demand for Venezuelan goods in its domestic and foreign markets. In the long term, the Chávez administration hopes this will diversify Venezuela’s economy away from its oil dependence—a necessary step for long-term economic vitality. Diversification, in turn, will generate a more stable and productive economy that should raise the population’s standard of living. The dual exchange rate policy, likewise, is consistent with Chávez’s ideological rhetoric and well-publicized concern for the poor. The president’s left-leaning agenda always has focused on Venezuela’s impoverished sector, marginalizing the more affluent and now increasingly, the country’s middle classes. By establishing its two-tiered system, the government appears to hope to encourage exports in industries that it labels “non-essential,” while continuing to enjoy the benefits of an overvalued currency for “essential” items. While this policy blatantly discriminates against foreign producers, doubling the price of their goods on Venezuela’s domestic market, it does allow for the country to maintain an overvalued currency for items that it must import. Most importantly, the policy provides the state with increased revenue from oil as it heads toward a challenging set of critical parliamentary elections in September that will help establish Chávez’s political future. The speed and urgency of the devaluation suggest that the short-term benefits were the determining factor in the government’s calculations. Though President Chávez emphasized the long-term developmental benefits, it has long been known that the bolivar was overvalued. The government has been consistently maintaining the currency at an artificially high rate for the past four years, so the recent devaluation marks a sharp turn in the country’s policy. An adjustment was inevitable, but the government could have devalued the currency in increments over a longer period of time. Chávez is intentionally cracking down on vendors who are raising their prices, yet with widespread perceptions of rampant corruption swirling around Venezuelan authorities, he now should pause to take a close look at his own administration and its bureaucracy. Opportunities for corruption will continue to emerge from the swift devaluation of the bolivar. A parallel market for the Venezuelan currency already exists, where it trades at slightly over six bolivars on the dollar (this market fluctuates due to the fact that there is no governing body to enforce the exchange rate). The government’s new policy, moreover, will provide an incentive for arbitrage as the two level pricing system will almost certainly be vulnerable to manipulation and bribery. Transparency International scored Venezuela at 1.9 out of a possible 10.0 on its 2009 Corruption Perceptions Index, the second lowest in Latin American (surpassed only by disaster-stricken Haiti). A designation below 3.0 indicates “rampant corruption.” Individuals who have a chance to take advantage of the opportunities to exploit the newly divided system will most likely do so, consequently allowing them to massively enrich themselves. President Chávez already has announced an increase in the minimum wage as a safeguard against the rising tide of inflation. Likewise, he has made it a priority to go after retailers that raise their prices in response to the devaluation before they have exhausted their stocks that were filled at a lower price prior to the devaluation. As the president’s crackdown on middle class sellers and producers adversely affected by his new policy continues apace, one cannot help but wonder if the more affluent, yet exceedingly marginalized sections of Venezuelan society will be able to gain more power in the September elections. Inflation is sure to erode the buying power of the country’s poor, whatever the government’s preventative action might be. This should cause the government a great deal of concern, as his staunchest allies are likely to suffer from the currency’s devaluation, despite his attempts to shield them from its worst effects. With imminent corruption and inflation, one can expect the government to struggle to retain support from the lower middle class, even from the poor, with September elections on the horizon that could seriously erode the president’s political standing. 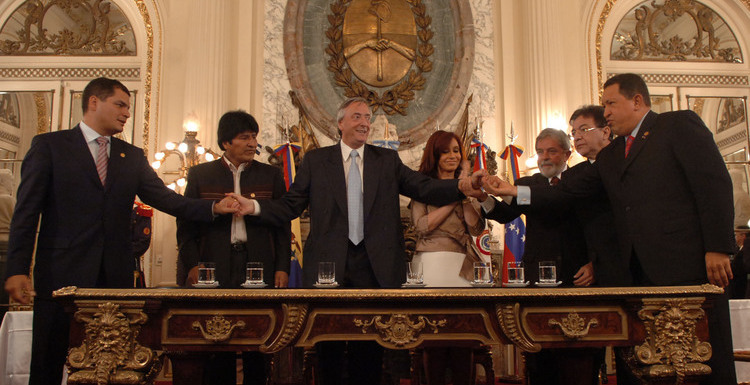 Development Bank in Latin America: Towards a So-Called Radical Emancipatory Project?